GLENDALE – Although the Super Bowl XLIX matchup has a northern tilt with the Patriots and Seahawks squaring off, the field they will play on will have a little southern flair. This year’s Super Bowl and Pro Bowl field was grown at Bent Oak Farm in Foley, Alabama, and was shipped to Glendale on 33 trucks two weeks ago. The same field will be used for the Super Bowl and Pro Bowl, with only the grass in the end zones changing between the two games. Mangan and his team of 30 workers laid the new grass and have been painting the yard lines and end zones adjacent to University of Phoenix Stadium the last few days. The field, which sits on a 92,000 square foot tray, takes 40 minutes to be transported in and out of the stadium on railroad tracks. 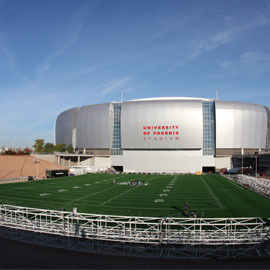 University of Phoenix Stadium features the only retractable field in North America. Mangan said the NFL feels confident using the same field for both games. The same process worked well when Miami hosted the Super Bowl and Pro Bowl five years ago. The games in Miami were played in the rain but the Glendale weather has been perfect for this year’s Super Bowl grass. 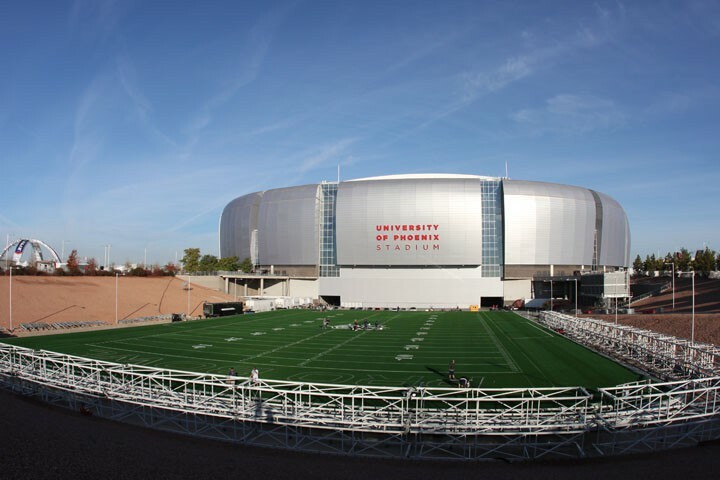 The field is scheduled to move inside University of Phoenix Stadium for the Pro Bowl Friday and taken back outside early next Monday morning for Super Bowl preparations. The field will go back inside the stadium the morning of Jan. 28. The Seahawks and Patriots — and the NFL's Pro Bowlers — will square off on the continent's only retractable grass field at University of Phoenix Stadium in Glendale. NFL field workers are out in force preparing the retractable field for Sunday’s Pro Bowl.